Industrial metal fencing, dance floor tile, leather, vinyl, rope hardware, floor tile, floor mat, masonry square tile, bent metal rod, acrylic and oil paint. 56 1/2 by 7 by 26 1/2 in. 143.5 by 17.8 by 67.3 cm. 61 1/4 by 15 by 36 in. 155.6 by 38.1 by 91.4 cm. Installed: 105 by 43 by 13 in. 266.7 by 109.2 by 33 cm. 96 by 36 by 30 in. 243.8 by 91.4 by 76.2 cm. bound flying scatter shot out. 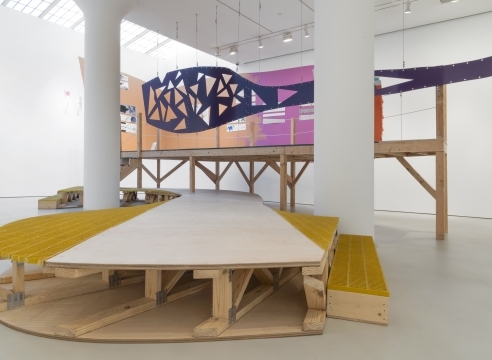 Mitchell-Innes & Nash is delighted to present Jessica Stockholder: The Guests All Crowded Into the Dining Room on view in our Chelsea gallery from August 25 through October 1, 2016. This will be the gallery’s third solo exhibition with the artist. Please join us for an opening reception Thursday, September 15, 6-8 pm. The Guests All Crowded Into the Dining Room will feature works from several facets of Stockholder’s practice, including a large-scale site-responsive installation in addition to distinct bodies of studio works. The studio-based works are made from both purchased and found materials, all of which are designed and manufactured by other people - furniture, plastic goods, fabrics, hardware, paint, paper. The line between a ‘raw’ material and ‘found’ object is blurry, and the intended-life of these objects is discarded but not forgotten. For example, a square of plastic floor and an orange rope are repurposed as formal, painterly elements, and yet their origins are clearly legible. The history and intended-use of these objects confront the viewer as Stockholder deftly engages the power of synergy, combining other peoples’ thoughts and objects into a form distinctly her own. Many of the works on view relate to Stockholder’s ongoing project of Assists, sculptures which must attach to something other than themselves -- a bed, the wall, furniture, other sculpture, or appliances. Each Assist is made up of four parts: two base parts and two top parts. The bases and tops are interchangeable. The Assists have a symbiotic relationship with everything around them. With the Assists, Stockholder continues to explore questions of boundary, dependence, and response to the landscape of human-made things, notions which have been central to her practice to-date. While the show consists of many different materials and forms, each work is accepted as a coherent, composed whole. Stockholder prods at the gaps between nature and human-made objects, between authorship and anonymity, between art, manufacturing and craft. The result is a destabilizing dynamism that threatens to pull the center out past its edges. 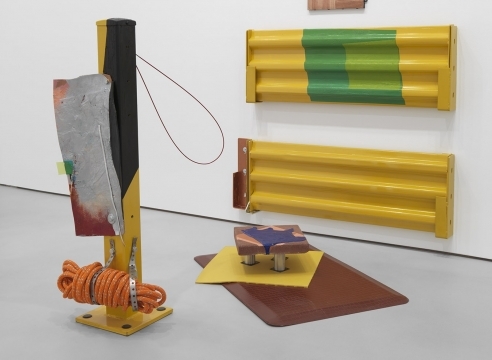 Blurring the line between painting and sculpture, Jessica Stockholder mixes found and bought objects with constructed and painted elements to a compelling effect. Although currently based in Chicago, Stockholder has exhibited frequently in various New York galleries, as well museums like the Whitney. 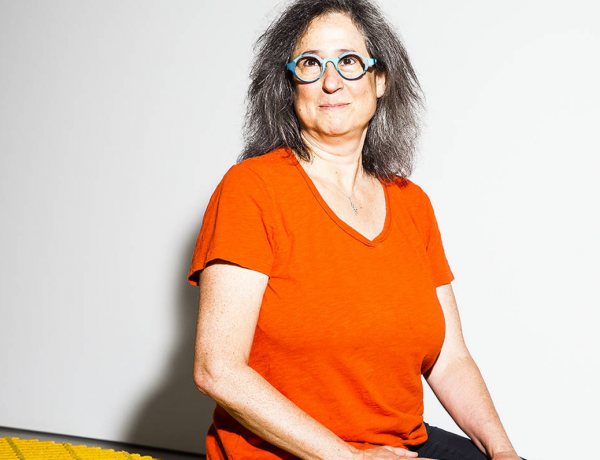 Over the course of a 30-year career, she’s become one of the most influential artists of her generation, setting the stage for the hybrid style of sculpture and installation that dominates the art world today. 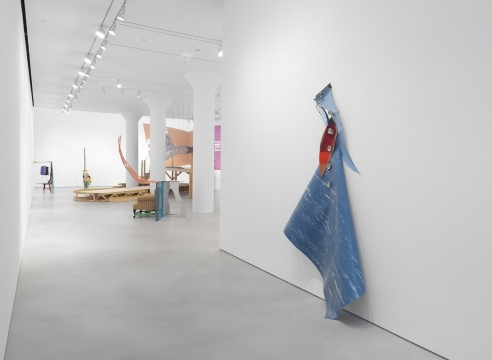 Recently, the artist chatted with Time Out New York to discuss her new gallery show in Chelsea at Mitchell-Innes & Nash featuring, colorful assemblages, drawings and a large-scale, site-specific installation. Kitty litter and coffee mugs, painted fur and tyre scraps: the materials lists for Jessica Stockholder’s sculptures read like the home inventory of a mad packrat. For three decades, Stockholder has taken as provocation that cliché ‘everything and the kitchen sink’ – incorporating even plumbing into anarchic assemblages that resolve as astonishingly balanced formal compositions. Exuberantly colourful and formally promiscuous, her work is deliriously enjoyable to look at. 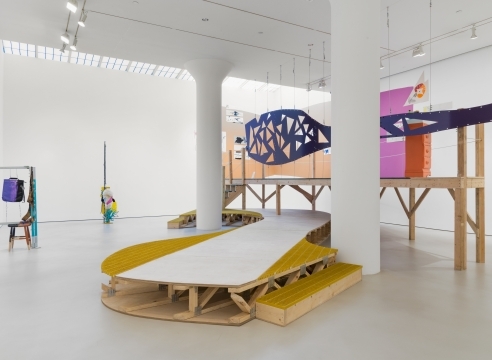 In “The Guests All Crowded Into the Dining Room,” her show at Mitchell-Innes & Nash in Chelsea, Jessica Stockholder playfully probes the intersection of edibility and sociability through a set of colorful assemblages. In The Guests All Crowded Into the Dining Room, Jessica Stockholder’s scattered arrangements of sculptural elements play with assumed boundaries to become a fluid meditation on space. Through a variety of materials and forms, Stockholder avoids overtly breaking down traditional artistic lines, so much as she highlights that they have never truly existed at all. In her third solo exhibition at the Mitchell-Innes & Nash gallery, Stockholder presents a multitude of studio pieces as well as a single “large-scale site-responsive installation.” By way of both found and bought materials, Stockholder reimagines the use and positioning of common objects in various bright colored displays. 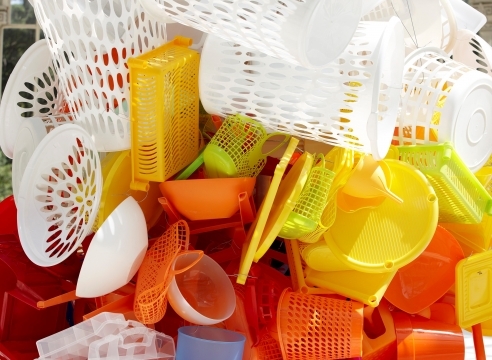 Think random, seemingly uninteresting items, like metal parts and yellow plastic pieces, curiously assembled to create a work that re-examines the relationship between materials. The artist is presenting “a large-scale site-responsive installation” as well as repurposed works of found materials using tire scraps, rusty hinges, roofing tile, and other such objects ripe for reinvention for her third show at the gallery. The installation, which is a winding yellow-and-white viewing platform, puts gallery-goers at eye level in order to see a selection of elevated drawings “with a splash of color” in closer detail. In Jessica Stockholder’s first show at Mitchell Innes and Nash since 2012, the pioneering mixed-media artist presents a new series of her curious hybrids. She makes her pieces by combining found and purchased objects, then altering and embellishing them with her own artistic materials, adding paint, string and the like. Jessica Stockholder’s colorful assemblages of diverse store-bought and found objects call to mind a term from neuroscience, “multisensory binding.” The phrase refers to the fact that the outer world appears to us seamlessly coherent, despite the many sensory signals streaming in from diverse sources — eyes, ears, nose, tongue and skin. Usually we don’t notice how the mind binds together these different inputs. In Ms. Stockholder’s engaging, if not wildly exciting, show of sculptures at Mitchell-Innes & Nash, your awareness of your attention’s shifting between the disparate parts and the whole composition is essential. 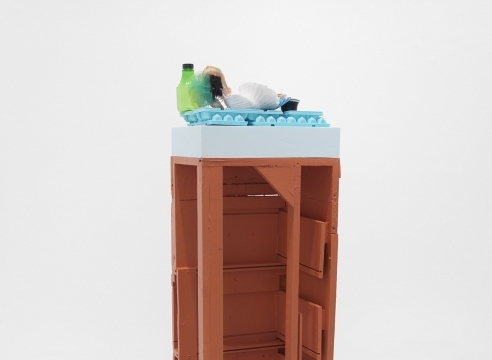 Stockholder’s work — a mixture of the made, bought, found, and painted: domestic objects, toolbox goodies, backyard decks, urban markers, and, most recently, a multi-purpose stage-set, viewing platform and pedestal – is inventive, practical, funny and very down-to-earth. 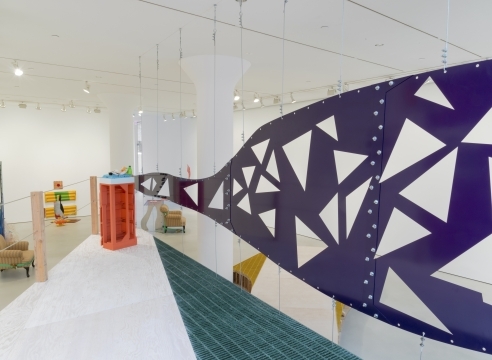 Creased, tied, folded, pierced, draped and bound: the repertoire of operations that Jessica Stockholder applies in her handling of found and manufactured materials is seemingly infinite. Blurring the boundaries between painting, sculpture and architecture, Stockholder’s current exhibition at Mitchell-Innes & Nash emphasises process, form, and, above all, gravity. 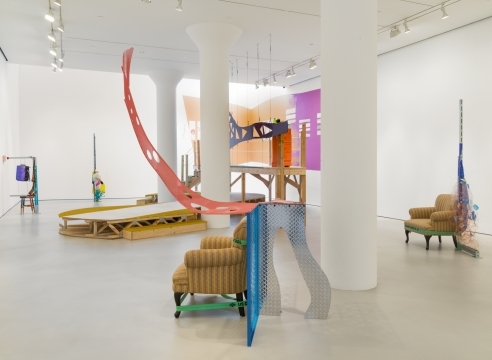 Jessica Stockholder’s work is difficult to talk about because it eschews so many of the typical classifications we use to discuss contemporary art: “installation,” “site-specific,” “ephemeral.” Indeed, that’s one of the most central elements of her practice: the dissolving of boundaries. On view will be more of the Chicago-based artist’s oddball installations, which typically assemble various colorful, unlike objects. 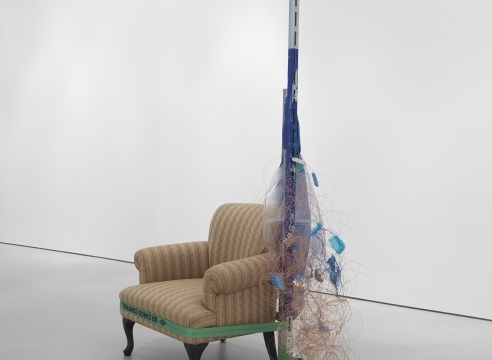 You could easily be tricked into thinking that these are all found objects, and that Stockholder put them all herself, but not so—she often deliberately selects her objects and relies on readymade materials.